For Epiphany, Sean Fletcher visits a spectacular light festival in Durham. He discovers the Christian history of the city and introduces hymns celebrating light. Browse content similar to Epiphany Sunday. Check below for episodes and series from the same categories and more! are celebrating the feast of Epiphany. sometime after the birth of Jesus to worship the light of the world. here in the beautiful City of Durham? and what led them to Bethlehem. might have meant the dawn of a new king. That is known to have happened. into people's homes for 90 years. I hear the story of the saint who inspired this great house of God. He suddenly saw a vision. A vision of angels guiding a soul wondrously bright to heaven. which comes from right across the country. written especially for the feast of Epiphany by Reginald Heber in 1811.
and to the Christ child. remains an iconic part of the Christmas story. to the story we've come to know. We have no idea there were three. The Bible doesn't mention there were three. because they had seen his star. It might have been a comet. It might have been what we call a conjunction of planets. of Jupiter and Venus together in the skies. in Regulus might have meant the dawn of a new king. That is known to have happened. We can show that has happened. but through them, for peoples everywhere. and looking specifically at that was Bede. Tell us about him. A big hero of mine and there he lies right behind us. Here we are in the Galilee Chapel of Durham Cathedral. Bede was a 7th and 8th century monk, a wonderful scholar. Probably born in the North East, not very far from here. in which he talks about Christ as the morning star. -Takes us back to Epiphany. Takes us back to, yes, Epiphany. I think is very beautiful. It's for a very special reason. Venus rises long before the sun does but in the same part of the sky. dawn will surely come soon. That's why, for Bede, Christ is our morning star. they have the sure sign of hope in the future. of the Lumiere Festival, and I've got a few steps to climb. Lumiere has grown into the UK's largest light festival. sound and light are combining. Well, I'm out of breath, but I've made it to the bell tower. by the bell-ringers behind me. And Chris is in charge. What can we expect? Um, so, you'll have heard bell-ringing all over the country. visually projecting what we're doing. understand what it is we're ringing. Helen Marriage is the woman in charge. of this lovely medieval city. But we turn it into an open-air art gallery. It's free to attend. Anybody can come. and the way they feel about those they share it with. And now a hymn that celebrates the God of light. as the shrine of St Cuthbert of Lindisfarne. about this great saint of the North. a bishop, and a saint. He's the reason that Durham Cathedral is here. He was born in the early 7th century. And grew up fairly normally. an epiphany, you might say. and he took this as a sign from God. had died that very night. A few years later, he too would become Bishop of Lindisfarne. and when he died, he was very quickly announced a saint. That was reinforced 11 years after his death. He'd been taken back to Lindisfarne and buried outside the church there. and they had quite a surprise in store. When they opened the coffin, they expected to find bones. But what did they have? A complete body, looking as if it was just asleep. He was incorrupt. He hadn't decayed. And this was a sign of great, great sainthood. So he became a focus for pilgrimage. People visited him. Again, miracles ascribed to his intervention. until the Viking raids forced the monks to flee. and they eventually settled here in 995 AD. But what's the function of the cathedral today? It's very much as it always has been. Our primary aim is to be here for the worship and the glory of God. But we also are serving the community. and we're part of the Unesco World Heritage site as well. has been watching it all. And he's still watching over us today. but the centrepiece is always the cathedral. People will come to Lumiere for all sorts of different reasons. we hope that they will pick up something of the light of Christ. They may have a moment of stillness. They may want to come back another time. They may just receive a warm welcome. we hope that they'll hear something of Christ in that. 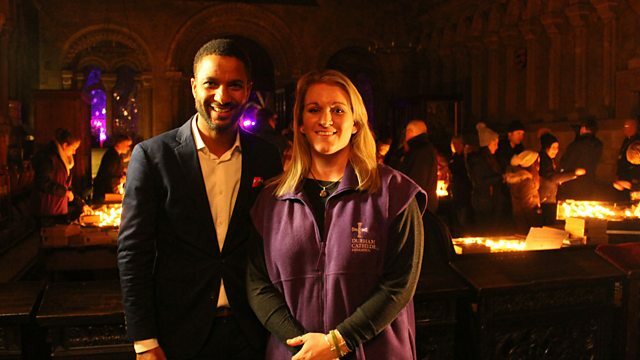 Rachael, you've been helping out with people lighting candles. What is it that draws people to lighting candles? of being able to remember someone. I think people feel drawn to do that. and that's something that's happened in your life as well, isn't it? where a service was being held. that's where my whole life changed really. "Come to the service whether you're of any faith or none." And I felt that I was included in that. And I had had a very difficult day. I did feel quite burdened. and to pause, and to reflect on my day. What happened? What was happening in your heart? the exact Bible passage, but I can't. and that God was calling me home. So it was a really incredible and quite overwhelming experience. we sat on some sandbags and he said, "Is everything OK?" And I said, "I'm really worried that I might be becoming a Christian." And he said, "Well, don't panic." And I spent the next nine months discovering who Jesus was. -..and you walked out a Christian. -Not the most glamorous of places to meet God. But it happens in the strangest places. Obviously, the Magi were in the desert too. and they desperately wanted to go and meet the Christ child. And it felt a bit like that for me. and then I wanted to go and find out who this Jesus character was. to people's homes for a staggering 90 years. Pam Rhodes has been tuning in to a bit of broadcasting history. of the new British Broadcasting Corporation. "who long to hear something daily of God and his love?" thought that there might be an enthusiasm for it. the first Daily Service went on air. is now the longest-running daily radio programme in the world. And it's endured some turbulent times. before, in 1992, it moved up to its new, permanent home in Manchester. from the modern studios in Media City, Salford. as I'm told I may have a job to do. 40 days more and Nineveh will be overthrown. -I was going to actually add something to the reading. -We can get this printed up. but that's a good thing, because it keeps you on your toes. There are still prayers. There are still Bible readings. What has changed is how the world worships. And The Daily Service has always been adaptable. It's always been fluid enough to take on the modern world. We get quite a lot of letters and e-mails. And this is quite a typical one. The Daily Service has been my go-to place on a good and a bad day. for this fragile and broken world that we live in. -Good luck. Five minutes to go. On long-wave and DAB digital radio, it's time for The Daily Service. We take presenters from a very, very broad range of backgrounds. that you have your one listener. that they're having a cup of tea with a friend. Jonah began to go into the city, going a day's walk. and encourage us to place ourselves at the foot of the cross. There to find our eternal home. to transform this city and this beautiful house of God. at the 150th anniversary celebration of Scripture Union. combine in worship of God. To mark Epiphany, Sean Fletcher is in Durham for the UK's largest light festival. He joins tens of thousands of visitors who come to see the medieval city and towering cathedral transformed by light installations. Falling each year on 6 January, Epiphany is the twelfth day of Christmas and marks the end of the festive period. Sometimes known as Three Kings' Day, it is a time to remember the story of the wise men led by a star to Bethlehem to worship the infant Jesus. Sean meets professor of physics Tom McLeish to discover more about this part of the Christmas story and explores the great cathedral to learn more about its rich Christian history. Brightest and Best - Church of St Cross, Winchester We Three Kings of Orient Are - St Mark's, Maida Vale O Lord of Every Shining Constellation - Christ Church, Port Sunlight It Came Upon the Midnight Clear - Romsey Abbey My Jesus, My Saviour - St Catherine's Church, Pontypridd Lux Aeterna - Pershore Abbey O Worship the King - Pershore Abbey Angel Voices Ever Singing - Romsey Abbey.